The same numbers often have a way of finding their way into writers' stories. In Star Wars, there's a frequent use of 1138, part of the name of George Lucas' first film: Wookieepedia currently notes 16 different usages of the number in Star Wars films, novels, comics and other products. I imagine numbers like 94 (for the Docking Bay on Tatooine) have also made appearances beyond what random chance would lead you to expect. Often, you're grasping for a number, any number — so it's not surprising that these are the ones that tend to come up. I did very little of that in the Knights of the Old Republic series. There are a couple of 17s, which was the age at which I began writing my first attempt at a novel — and then there are two 560s, which have significantly more personal meaning. My grandfather, E.V. 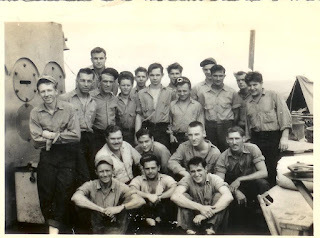 Taylor, served as chief machinist's mate aboard LST-560 in the South Pacific during World War II. That's him to the left, there, with my grandmother and mother. LST stood for Landing Ship — Tank. These were the massive vessels that brought heavy machinery to the shores of the Philippines and other islands; the ships would come in and winch themselves up onto the shore to discharge all manner of vehicles. They didn't have names, just numbers — there were too many of them, and as logistical vessels, keeping track of them was the important thing. LSTs were armed — they had deck guns, primarily used in supporting their own amphibious operations — but they had the turning radius of an iceberg. The joke was the name stood for "Large, Slow Target." 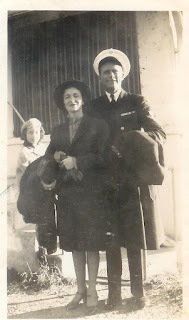 My grandfather — that's him there, to the left, with my grandmother and mother — often told me stories about operations in the Philippines and life aboard ship; also how he trained and got out there in the first place. Before he passed away, we made some audio recordings of the stories, and also found some of his photos. 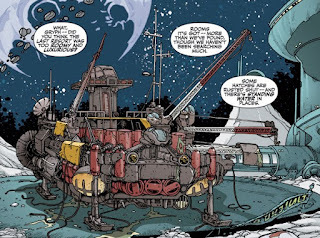 Anyway, it was the stories about the LST that caused me to think about spacelift in the comics. How would the Republic Navy get ground forces from place to place? That became a major part of the Serroco storyline, in Days of Fear. I put Carth Onasi aboard a large, ungainly ship delivering vehicles and supplies; and it being science fantasy, I made him the only crewmember aboard the ship. It seemed to me that lading would involve droids and other mechanical aids. And while Carth called his own ship the Deadweight after its poor handling, we provided its official name in the Knights of the Old Republic Campaign Guide: CXB-560. I had always felt that the Deadweight was pretty sleek for a vessel intended to be ungainly — and I had always wanted to do something that involved unorthodox weaponry in ship-to-ship combat. Thus was born the Hot Prospect, a lightly-armed mess of a ship. Remembering my grandfather's stories about winching onto shore in the LST, we included a sequence in The Reaping where the ship's winch is used as an offensive weapon (because there's nothing else available). And, as we learn in that story, the Hot Prospect is part of the Calipsan 560 line. A light little personal tribute to my grandfather, gone ten years this year. If Gryph got his world-class charm from anywhere, he was one of the original sources! Learn more about LSTs at the U.S. LST Association website.